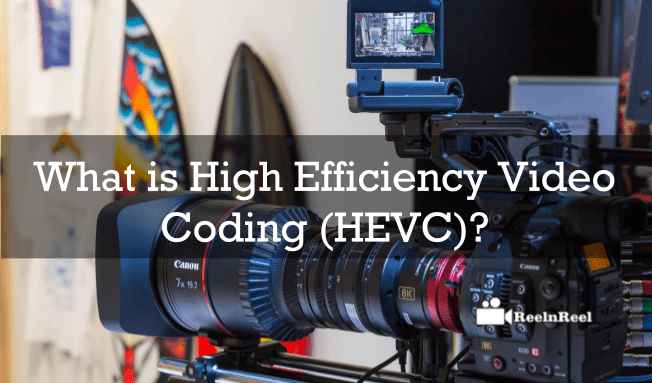 What is High Efficiency Video Coding (HEVC) ? Home » Video Marketing » What is High Efficiency Video Coding (HEVC) ? The new video compression standard is the high-efficiency video coding which is also known as H.265 and was developed by Joint Collaborative Team on Video Coding. Higher compression ratio is the strength of HEVC compared to earlier coding standards. HEVC also utilises low bandwidth ratio. H.265 can save at least fifty percent of the bit rate at the same quality. There are more tools in HEVC for using to reduce the bit rate. Difference between x264 and x265? Before knowing what high-efficiency video coding is, let us first see what video codec is. It is a technology that compresses the video files into packages so that storing and transmitting it becomes easy. HEVC is the advanced technology that also helps in streaming 4K that is ultra HD video. High-efficiency video code compresses the video file to half its size. For this, it uses the encoding format H.265 or MPEG-4. HEVC technology also compresses 4K resolution videos. It is also expected that the technology will be available in the future for compressing 8K resolution video. H.265 codec is another name for High-Efficiency Video Coding. H.265 Codec is the successor of AVC or H.264. The picture quality offered by both these technologies is same, but they differ when it comes to compression. H.265 offers better compression and the data to deal with is less. The large data that comes from HD cameras is compressed to reduce the data. This way, it becomes easier to manage it. One of the ways to compress the video is to reduce the quality. The video quality will be affected by this, and the image may look noisier or softer. Another option to reduce data is to use compression which is smarter. H.264 offered more advantages that MPEG-2 on Blu-ray. H.265 is a better compression technology. MPEG 4 is known as H.264. This technology used in a system such as HDTV, HD DVD and Blu-ray. This technology also is used in devices such as Apple iPod and Sony PSP. MPEG 4 AVC is a better compression technology that MPEG-2 and MPEG-4 ASP. MPEG Advanced video coding offers at least half the bit rate of MPEG-2 and other earlier standards. MPEG 4 AVC can be applied to various applications on various networks and systems. H.264 is also called the X264. This is actually an encoder for H.264 format. Another name for this technology is MP4 which is also not correct technically. Both X264 and X265 are video compression standards for compressing video size. X264 is earlier code than X265 and is used in many videos. When X265 used, the video size is smaller, and the quality of the video is better than when X264 used. X264 use higher bitrate a provides thebetter video quality Some say, but the issue is with the size. X265 gives you less size and also better picture quality than compression codecs that are available. H.264 or Advanced Video Coding technology that was introduced in 2004 and H.265 was approved in the year 2013. That means H.265 is the advanced technology. H.264 was adopted by cable, satellite and terrestrial broadcast. It also used in blue-ray, video conferencing, mobile video and security systems. The bit rate of H.264 is 40 to 50 percent, and at this bit rate, the visual quality is better when H.265 used. H.264 supports up to 4D and H.265 can support up to 8K video compression. The high bit rate of H.265 makes the UHD content delivery unrealistic. The main drawback of H.265 is that it is computationally expensive. The above guide helps you to know more about what is High-efficiency Video coding? What are the technologies in HEVC and its comparisons. How to Win the Video Marketing Game ?